We all had our favorite toys when we were kids. Some of them stick out in our minds. Some of them we loved so much that we wore them out. Some we remember fondly but we have no idea what happened to them. There has to be a collection of favorite, forgotten toys somewhere, waiting to be rediscovered by old friends. Occasionally, I think of some of those old toys and wonder what happened to them. One of my favorite toys was a small, riding motorcycle. The little green motorcycle was easily one of my favorite toys. I had a black one, too, which was identical to my cousin Mike’s motorcycle. When we were still living in Lyndonville, we’d play in the backyard on our motorcycles. I loved both the green one and the black one, but the green was absolutely my favorite. I rode that motorcycle so much that I broke the handlebars several times. My dad had to repair it a lot. There was a bolt that he added to keep the handlebars in the correct placement. I also had a feature that did not come on the stock model. My dad drilled a small hole in the handlebars where I could insert a key. Yes, I had a key for my motorcycle just like my dad. He apparently had an extra key to something and gave it to me. How cool was that? I still have that green motorcycle. It’s in my attic. When my daughters were younger, I let them use it for a little while. For one of my dad’s birthday or Christmas presents, I took a series of photos of the twins riding the motorcycle. I put them into a frame with captions. They wanted to show Papa that they were riding a motorcycle just like he did. That frame hangs in my mom and dad’s family room. The girls are too big for that motorcycle, but I’m still hanging onto it. It currently is stored in the attic. I’m saving it for years later when I have grand kids. As long as they don’t wreck it, It should be good for years and years. Back in the 1970s, they built things that would last a good, long time. There are still toys from my mom hanging around, and the bassinet that my grandmother used to sleep in when she was a baby in 1920 is in my attic. Family heirlooms have the greatest stories. Biffy Beans was another of my favorite toys. Wendy has my Biffy Beans stored in her hope chest next to the bed. It used to be that boys didn’t have dolls, but we had Biffy Beans. He was a boy doll, wearing a pair of blue overalls with a matching hat and a yellow, orange and white striped shirt. This was long before the “My Buddy” craze of the 1980s. Biffy would sit sentinel over my bed during the day. I still have all my Tonka trucks and their Fisher-Price counterparts. The girls have them in their sandbox. The crane, which was always the hardest to store, takes up the most room. Some of them are rusty, but they still work wonderfully when digging deep pits in the sand. When I was young and the dump trucks were new, my cousins and I all had them. We’d ride on them. Those metal beasts could take a beating. And they still survived. 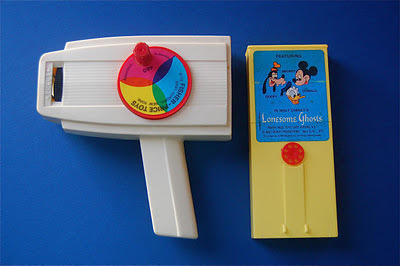 One of the toys that I loved when I was a kid was the Fisher-Price Movie Viewer. Some of the younger readers will have no idea what I’m talking about when I say this: This toy used was looked like a hardier version of 8-track cassettes to show movies. You’d have to aim the camera towards a light source and hand crank the movies to watch it through the tiny eyepiece. We had a handful of movies. My favorite, by far, was a Looney Tunes one featuring the Roadrunner and the Coyote. One of the things you could do was run it at any speed you wanted to crank. You could watch the road runner slowly eat the pile of feed and gunpowder with the Coyote waiting for the seemingly inevitable explosion. Of course, you could also run the movie backwards so that the Coyote flew back up the cliff and was miraculously saved. I have no idea what happened to that toy. I money is on my mom selling it at a garage sale. 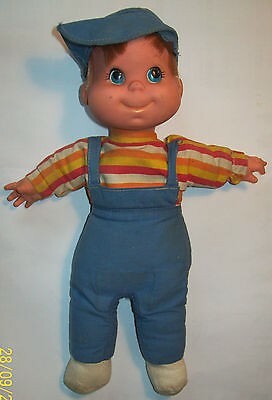 Another of my favorite toys that disappeared actually came from my grandmother’s house. It was a handheld water rocket. 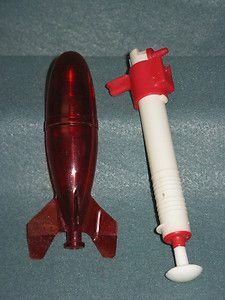 You’d fill the rocket with water, then attach a pump to the bottom of the rocket. You’d have to pump as much air into the rocket with the water as you could, until you couldn’t pump anymore. Then, you’d aim the rocket into the air and pull the trigger. Depending on how much you were able to pump, that rocket would shoot high into the air. If you weren’t aware of how your were holding it, you’d get soaked. At the same time, that rocket could really fly. There were a lot of rooftop rescues. I know there are other toys that I really liked that I can’t remember offhand. I’m sure as I keep thinking about it this week, I’ll remember more. What were your favorite toys? Do you still have any of them, or have they disappeared over the years? Craig Bacon still plays with toys. Some he shares with his kids. Some he does not.